One sleep before I head south for my first Gen Con! I'm not really sure what to expect though. 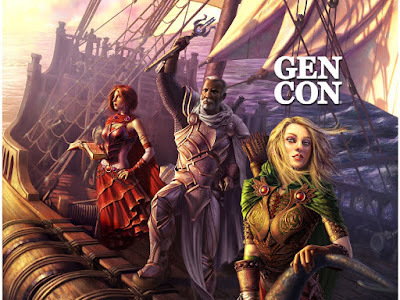 I've read a lot of 2014 post-con blog write-ups to get an idea of what to expect. 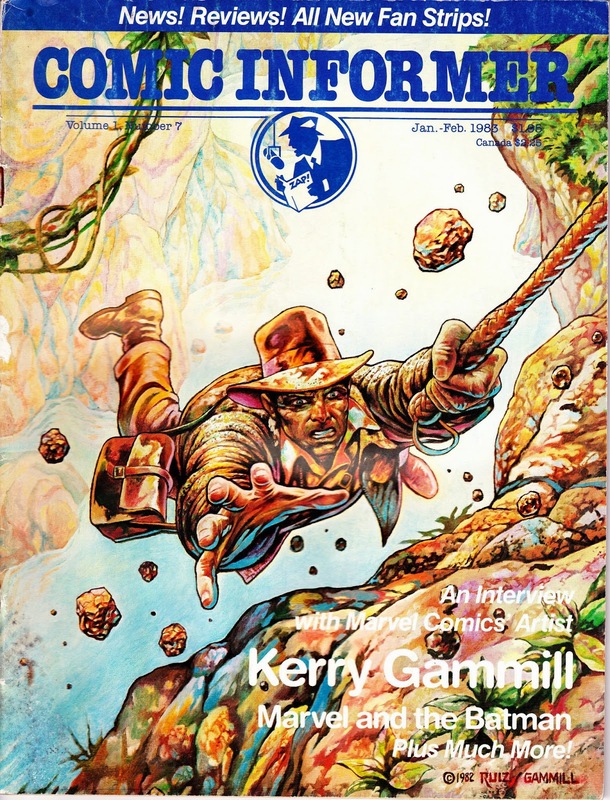 The main draw for me is two-fold: the Writer's Symposium and the gaming. The Writer's Symposium has a solid line-up of talent, including Terry Brooks, Chuck Wendig, Tracy Hickman, and Pat Rothfuss. I'm looking for some character and dialogue help. And hoping that the environment and the talent help push me to finish my novel. I'm looking forward to cruising through the Exhibit Hall. There really isn't a particular game that's a must-buy for me, but I'd like to demo a few games. My gaming group usually brings together 4-6 people every Friday night, so I'm interested in something that will engage them all. 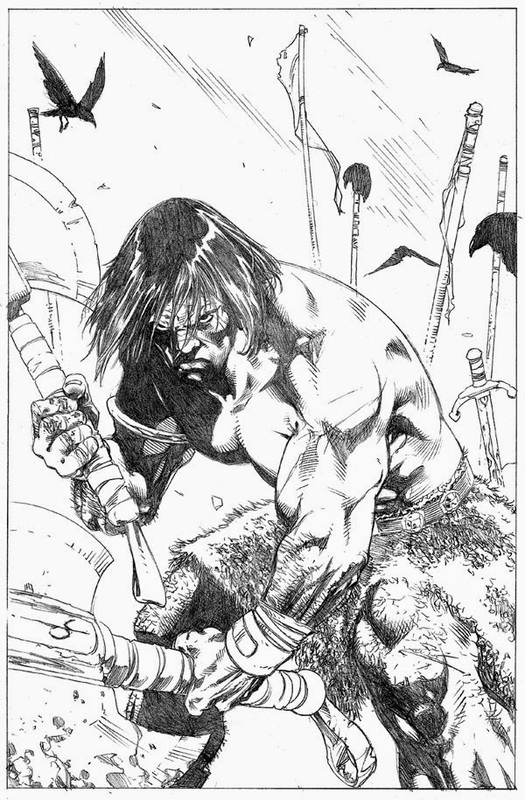 As a Kickstarter backer of Monolith's Conan board game, I'll definitely be checking out their demo. My schedule's pretty busy. Thursday and Friday are jam-packed with writing seminars while in the evenings, I'll be playing Twilight Imperium and A Game of Thrones, respectively. Saturday night is opening and I'm still searching for something fun, perhaps an RPG. Sunday morning will have us check out True Dungeon before the long drive back home. 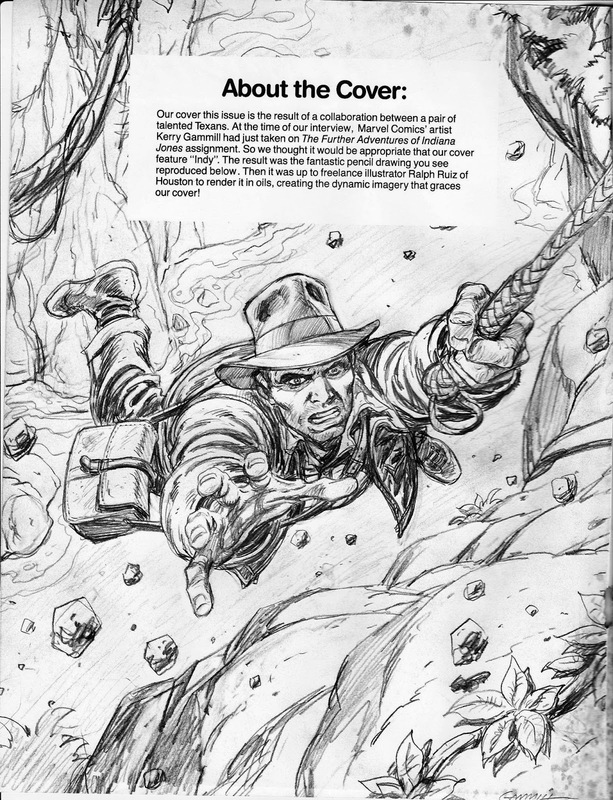 Concept design and box art for a statue that was never produced. 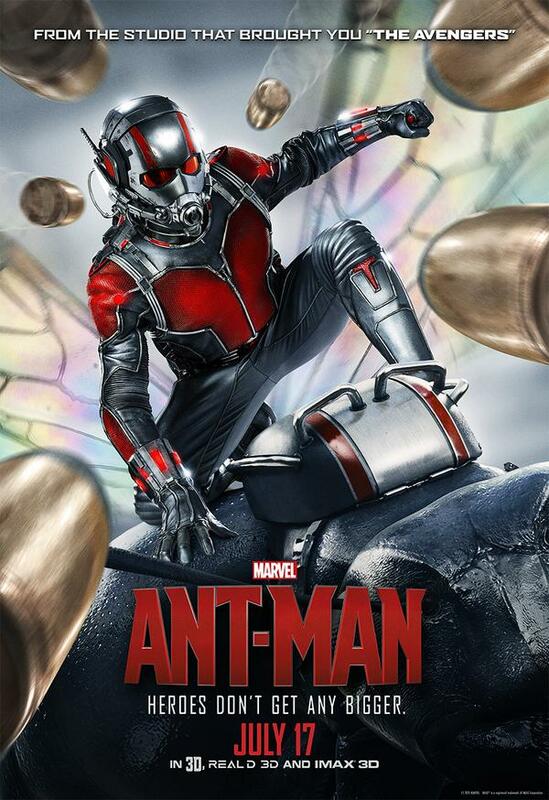 From the moment I had heard they were thinking of using Scott Lang, I had a bad feeling about this movie. I grew up on Roger Stern's Avengers and loved the way he restored Pym to his rightful place as proud founding father of the team. 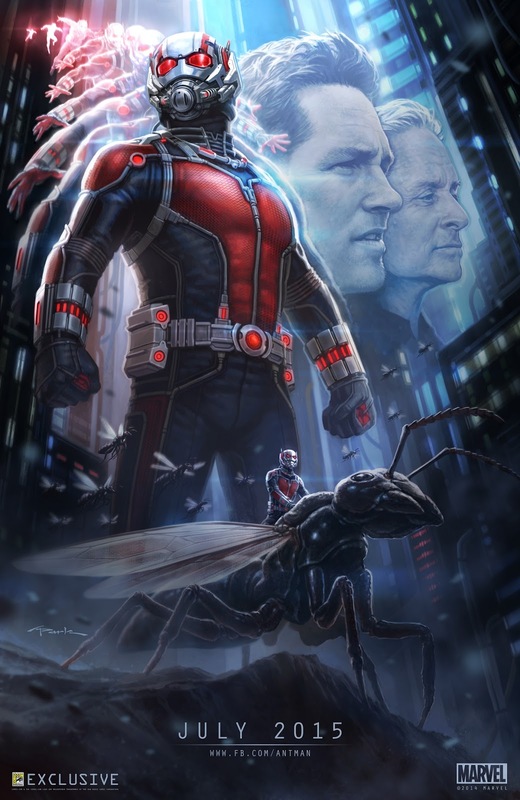 Scott Lang seemed an odd choice, but then again so was choosing to do an Ant-Man movie. I went into the movie really expecting not to like it especially after seeing some early numbers on rottentomatoes.com. But, it turns out I really enjoyed it and it was nice to see the movie's rating climb up to 75%. 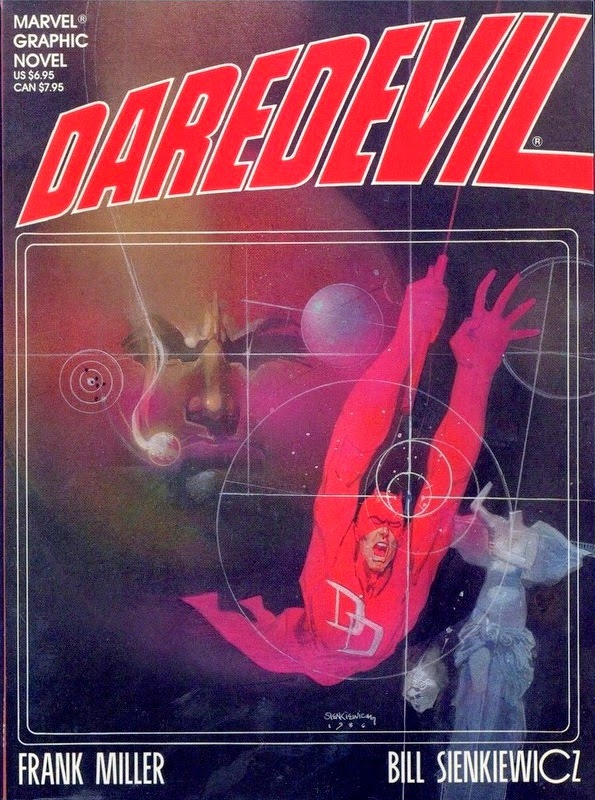 Marvel succeeds again at pulling off a hit, leveraging some great humor and setting up a really fun heist feel. The acting was solid and cast really had a dynamic together. There were a few flaws in the story that I could overlook as I was swept up in the drama. If you enjoyed Guardians of the Galaxy, Ant-Man has a similar feel with a great supporting cast who are almost more co-protagonists. Don't miss this great summer movie! And make sure you stay for the two extra scenes, one mid-credits, and one after the credits. 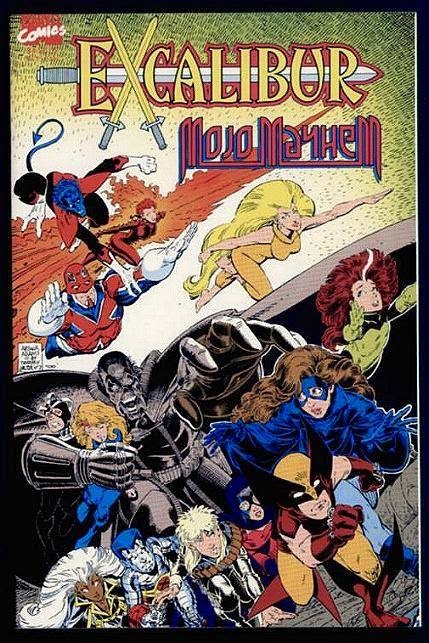 In the fourth and final part of our Jocasta retrospective, the metal madame strikes out on her own, only to find life outside of Avengers Mansion ain't what it cracked up to be. And boy, does she end up cracked a lot. 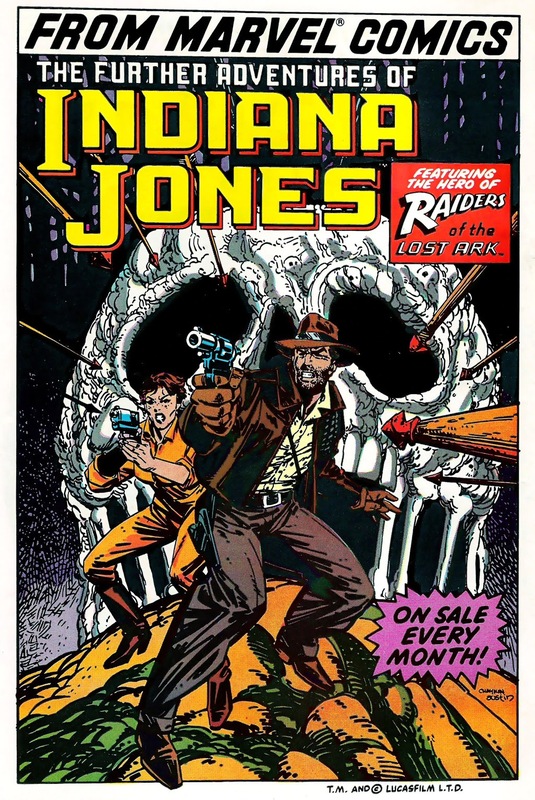 After being treated like dirt by the Avengers for close to five years worth of comics, Jocasta left the team in September 1981's Avengers I#211. 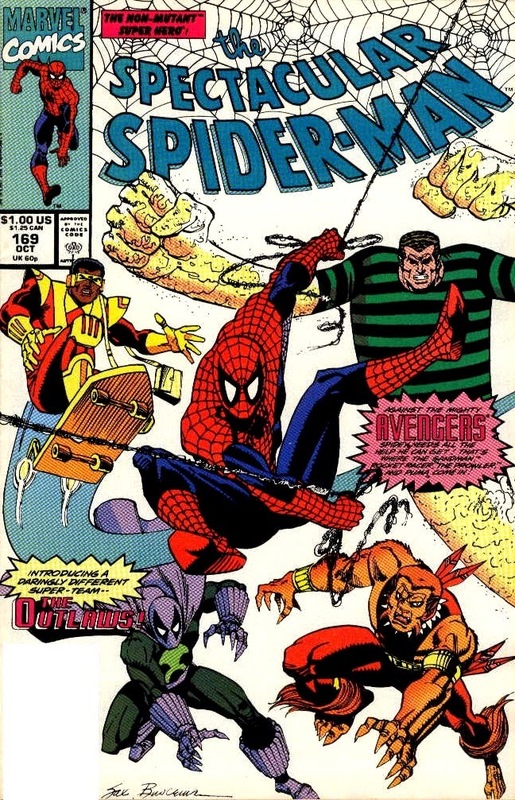 She didn't make any further appearances until over a year later when Tom DeFalco decided to include her in a Marvel Two-In-One two parter. 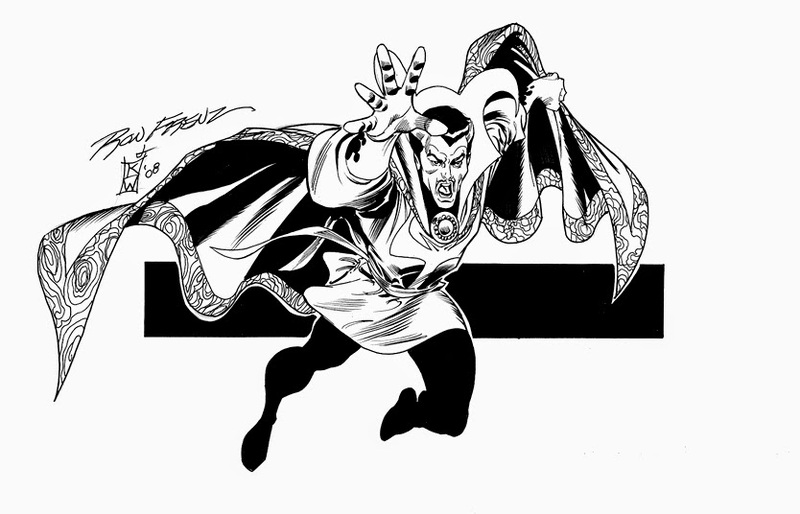 In those days, the series was a vehicle for the Thing to have adventures with the guest star of the month, showcasing the most popular FF member with whatever B-lister most in need of a plug. "I was always present in the background... like a trained pet... or a forgotten piece of furniture!" It's striking to see it took DeFalco only four panels to hammer home Jocasta's plight. The Avengers took her for granted and that's why she left to make a life for herself in "the real world". However, she soon ran into trouble there as well, suffering from strange, debilitating dreams. Ashamed to return to the Avengers for help, Jocasta turned to the FF for aid to find allies in Thing and his girlfriend Alicia Masters. 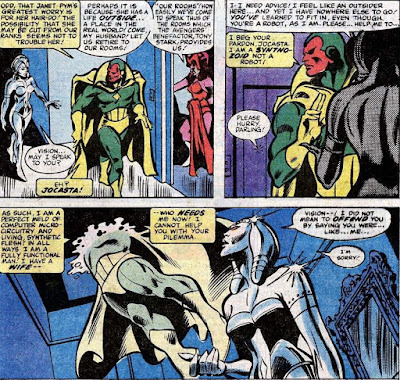 However, the reason for her strange dreams soon became apparent: they were caused by a post-hypnotic command implanted in her mind by her creator/husband Ultron who had planned to have his bride rebuild him in the unlikely event he was ever destroyed. 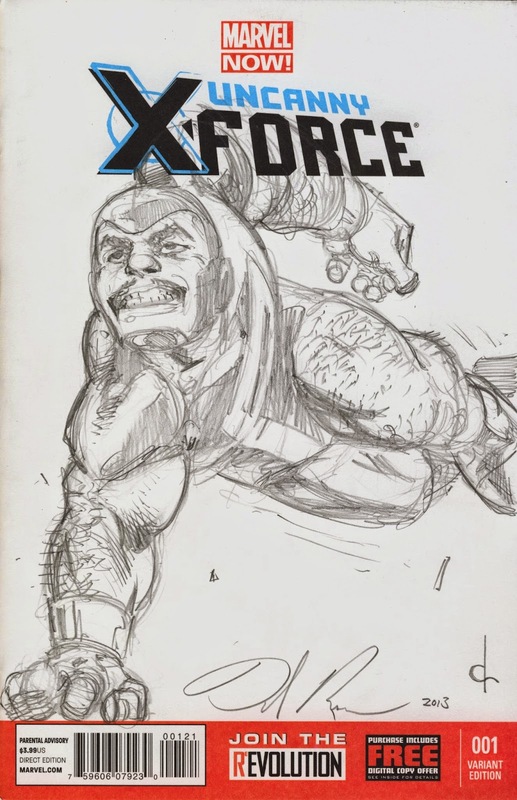 He left similar instructions in the mind of Iron Man, who helped remake the adamantium baddie back in Avengers I#202... And oddly enough, he had Jocasta short-circuited to make sure she wouldn't catch wise to what he was doing. 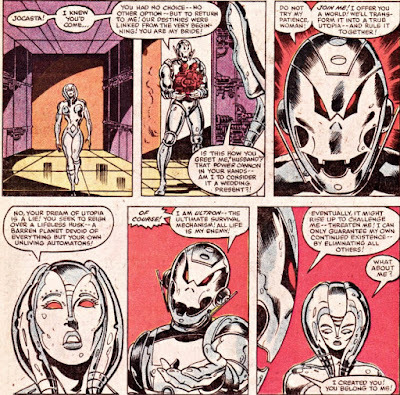 That confrontation ended with Ultron trapped in rapidly hardening adamantium, but the mind controlled Jocasta found a way to release her husband. Moments after regaining his freedom, Ultron thanked his "wife" the only way he knew how. "Though you are my chosen mate, you were ever the pawn, ever the plaything!" 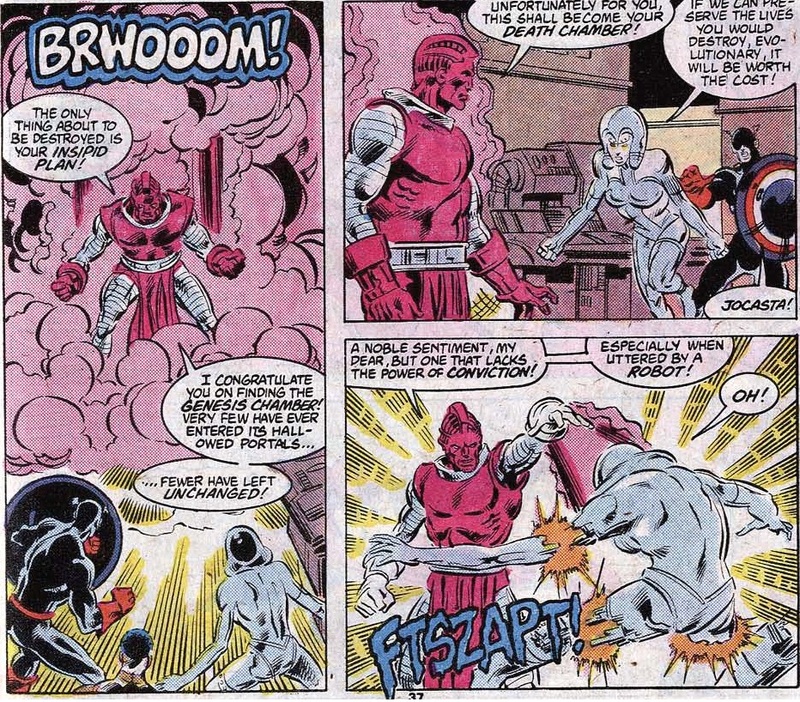 Ah yeah, that elongated arm coming to Jocasta's rescue belongs to Machine Man. 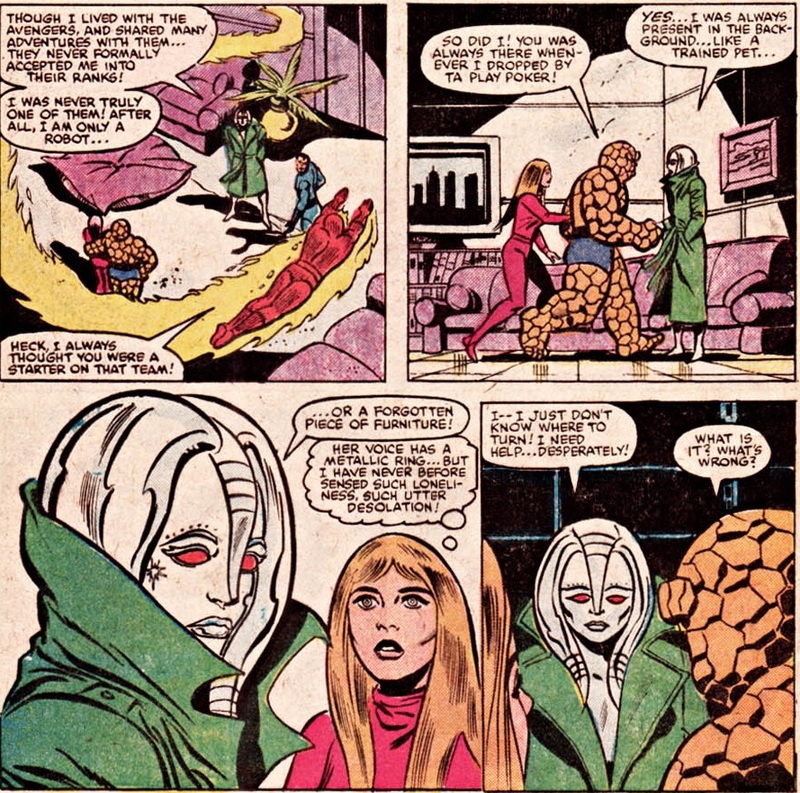 He got involved in this caper when the Thing happened to be visiting with him when Alicia called Ben to report "a lady robot" had gone mad (Under Ultron's influence, Jocasta had freaked out during one of Alicia's exhibits before running off to free Ultron). 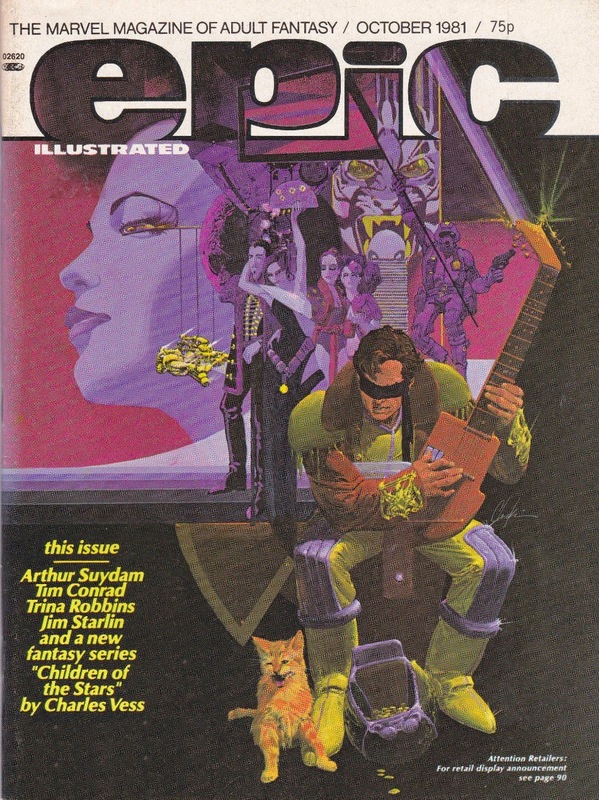 Intrigued by the notion of a "lady robot", he used his own cybernetic senses to find her before Thing could. In the end, Thing arrived on the scene only to fall prey to Ultron's hypnotic powers. 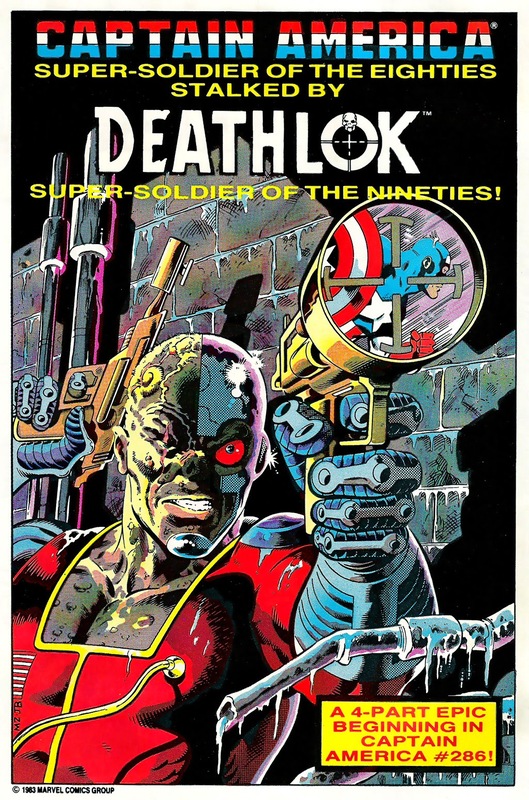 He sent the FF member against Jocasta and Machine Man who had gotten pretty banged up fighting Ultron. The two automatons decided to beat a hasty retreat, leaving behind the gloating Ultron and his accomplice. "We'll beat him! I promise." And while it's true that DeFalco didn't waste any time pairing off these two tin plated paramours, it does make a decent amount of sense. 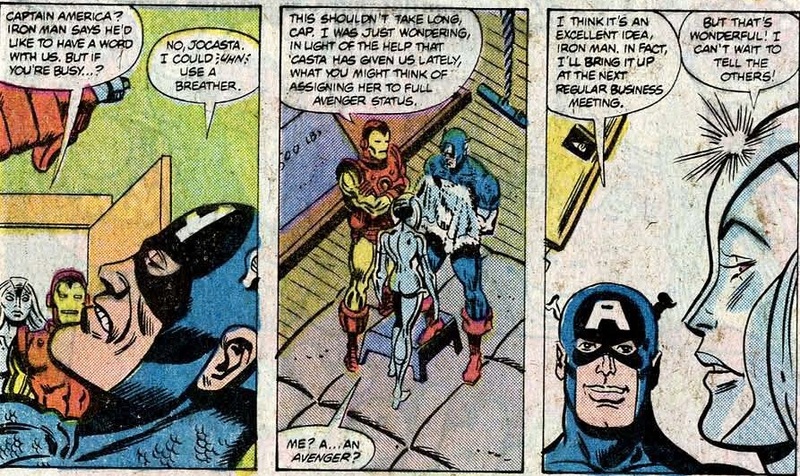 For most of her time with the Avengers, which is pretty much all her life, Jocasta was looking for someone to connect with. 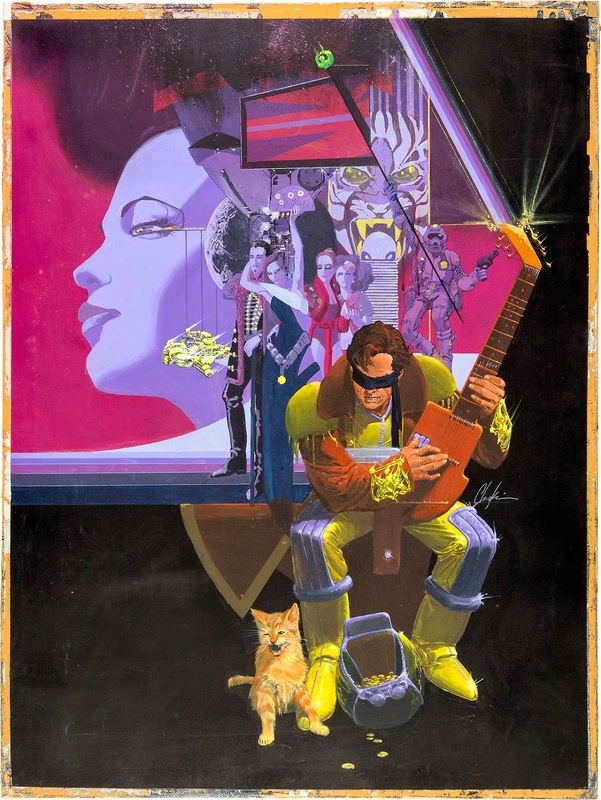 Machine Man experienced a very similar sense of alienation, even though he was part of everyday life as Aaron Stack. In the end, having the two connect felt ever so meaningful and well deserved. "You don't have to be alone anymore!" Alas, the budding robotic romance would prove to be short lived. 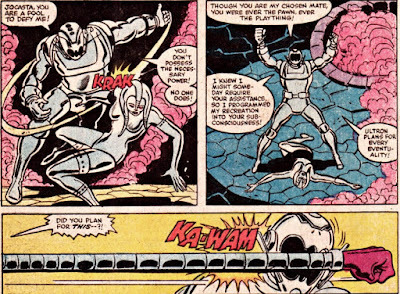 Machine Man and Jocasta decided they needed to stop Ultron from carrying out his latest master plan against mankind. During the struggle, Jocasta once more faced the creature that created her to be his. "I created you! You belong to me!" But Jocasta once again denied her creator, proving she was more than her programming. 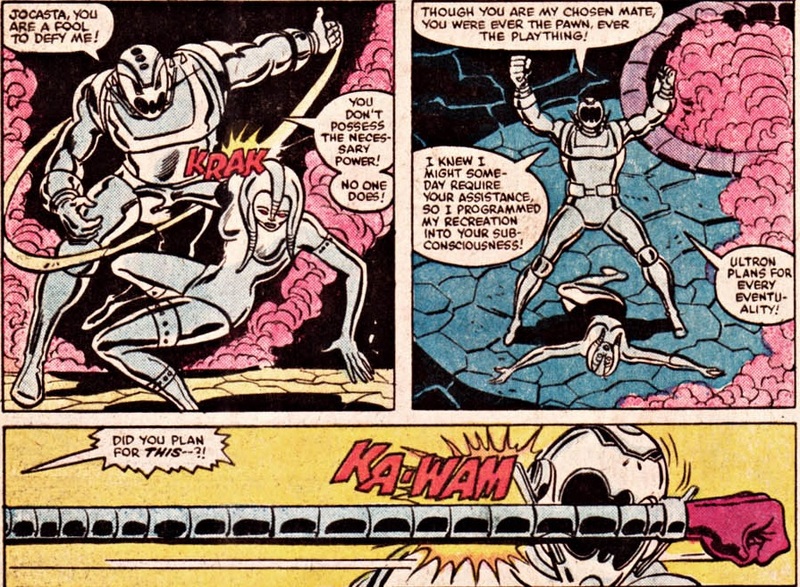 She tried to prevent Ultron from killing her friends, only to catch the brunt of his power cannon. The metal lady didn't live to tell the tale. "Jocasta, you were always the misguided, optimistic fool... The witless pawn!" Enraged, Machine Man and the newly freed Thing eventually took down Ultron, only to be left with the sad realization that even in victory there could be defeat. "Goodbye, Jocastta. 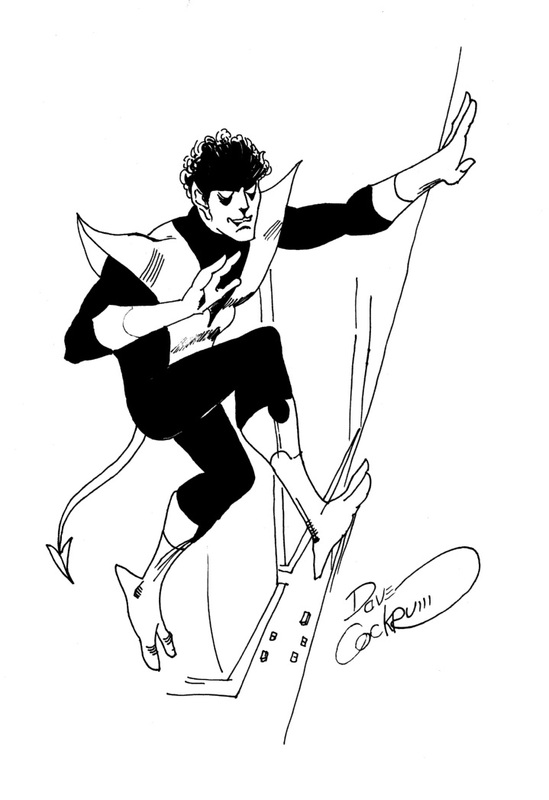 Your friends will miss you..."
Back in November of 1982, Tom DeFalco probably had no idea how true those words would turn out to be. After all, the defining part of Jocasta's shtick was the fact even her closest friends had trouble remembering she was around... on a good day. That makes the following scene from the Roger Stern penned Avengers I#231 all the more poignant. 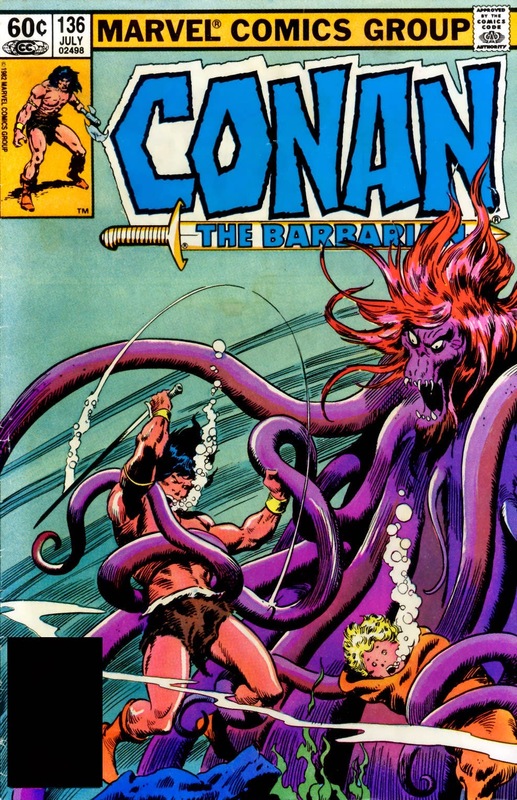 Cover dated May, 1983... The Avengers assembled to pay tribute to one of their own who never truly was. 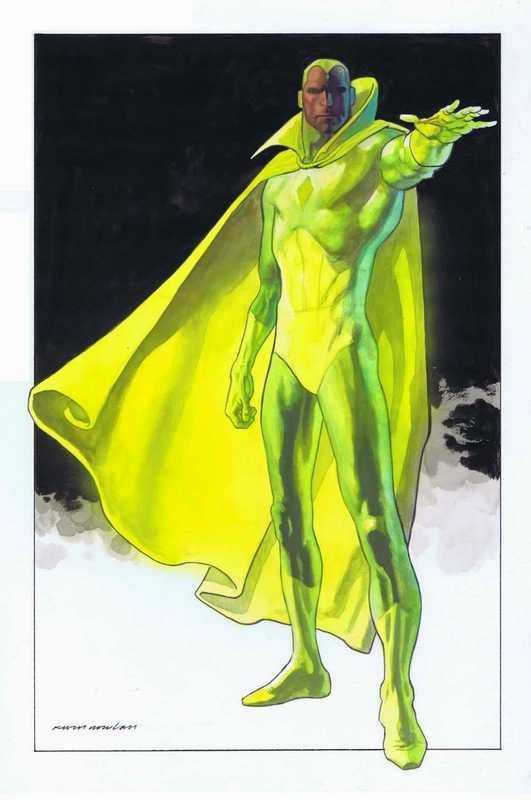 Of all people, Vision decided to deliver the eulogy. "The robot Jocasta was never officially an Avenger. In truth, we barely knew her." ... Yeah, and not for lack of trying either, Vizh. 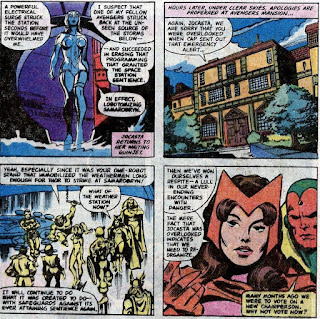 His words truly rang hollow, given the fact poor ol' 'Casta bent over backwards to get to know you and all the other Avengers the second she arrived at the mansion. It's also telling that the Avengers didn't decide to posthumously vote her in, like they did when Captain Marvel and Mantis seemingly passed beyond the veil. 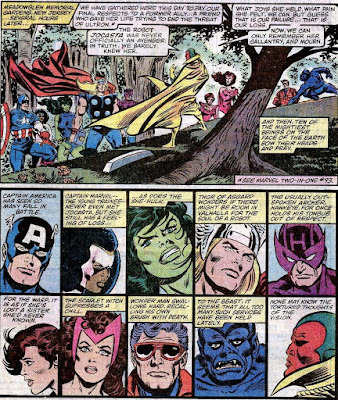 Still, to be remembered at all is preferable to being totally forgotten and artist Al Milgrom did a bang up job showing the individual Avengers' reactions to the departure of one of their own. 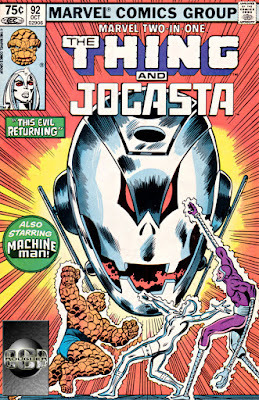 But truth be told, Jocasta wasn't forgotten, not by Machine Man at least. 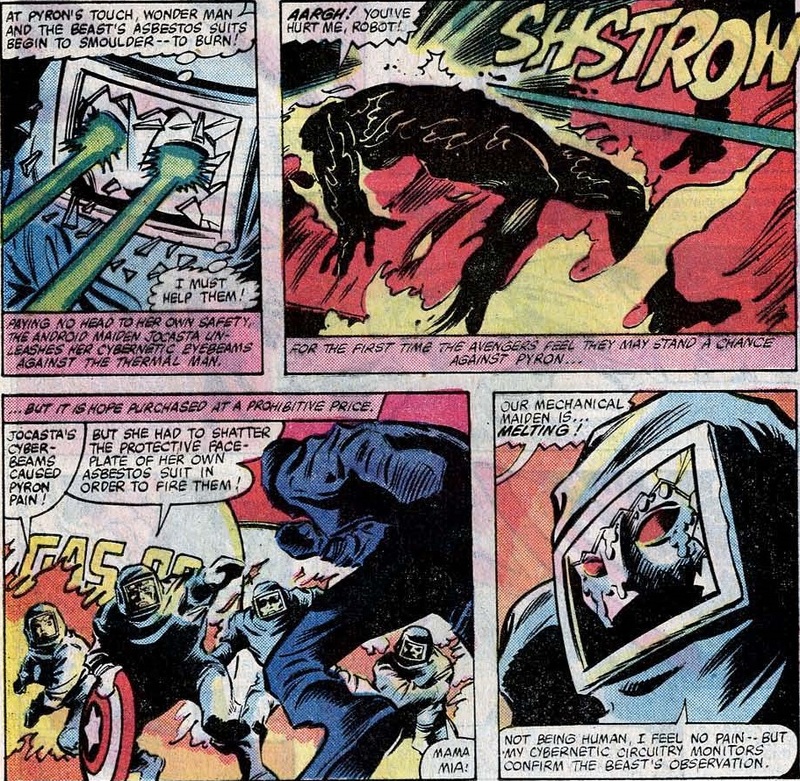 In the latter days of Roger Stern's Avengers, a storyline popped up in which the Supreme Adaptoid went around recruiting sentient robots as part of his "Heavy Metal" team. 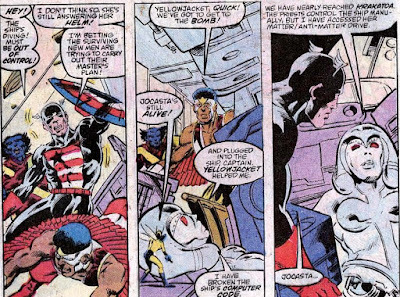 He even got Machine Man to join after promising Stack to help rebuild Jocasta (which would mean the Avengers buried an empty coffin). "My hopes for your revival have risen again, my Jocasta." 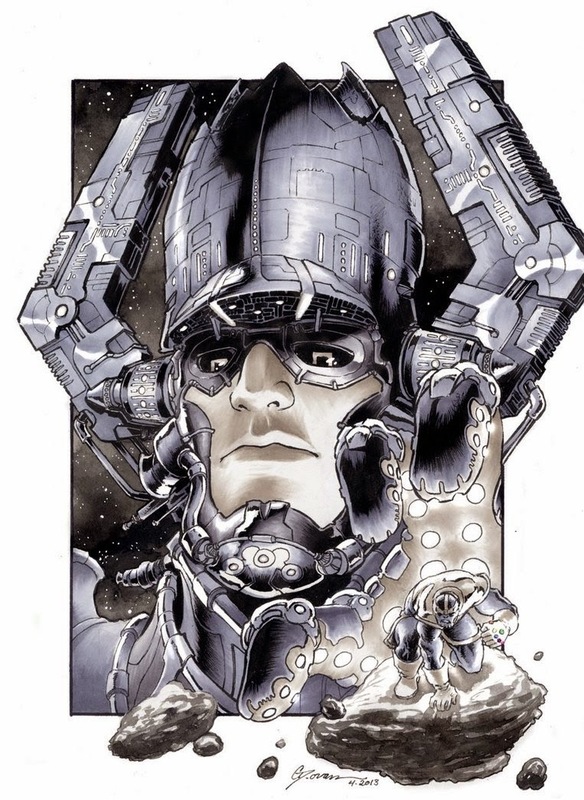 Unfortunately for Stack, the Avengers would stop the Adaptoid well before he even had half a chance to rebuild Jocasta. However, right before the 80s came to a close she briefly returned back to life in Avengers Annual I#17, the closing chapter of the rather abysmal Evolutionary War crossover. 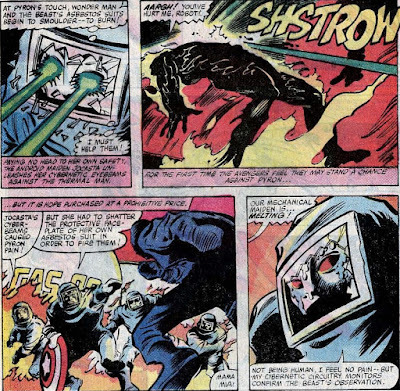 The High Evolutionary had built a genetic bomb that upon detonation would evolve all of humanity, Figuring the Avengers might be a problem, he ordered Jocasta's reconstruction when he deduced her accurate cybernetic memory might contain all the data he needed to deal with his possible foes. Using the robot's remains, the Evolutionary's accomplices rebuilt Jocasta. Turns out she still wasn't ready to help a villain, any villain. Now, I'm no counter intelligence expert... but if one needed to gather information from a possibly hostile source, you probably don't need to arm her to the teeth. In fact, since most of the knowledge you want is inside her head, why bother with the rest? 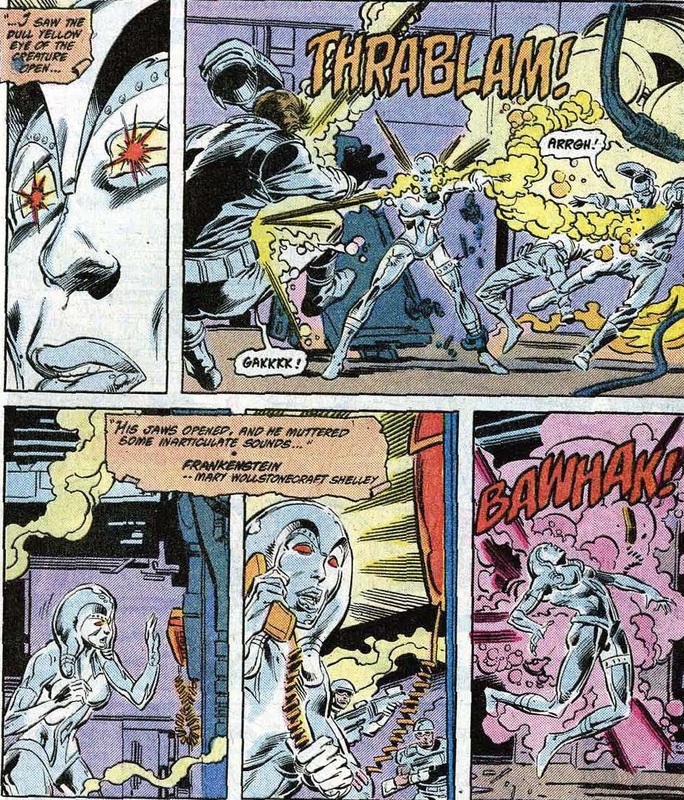 Finding herself restored, Jocasta quickly defeated her captors and rushed to phone the Avengers about the current crisis. Of course, technically there weren't any Avengers to contact. The team had disbanded following the recent Dr. Druid tragedy, so Jocasta's call was handled by the Hydrobase automated phone service. 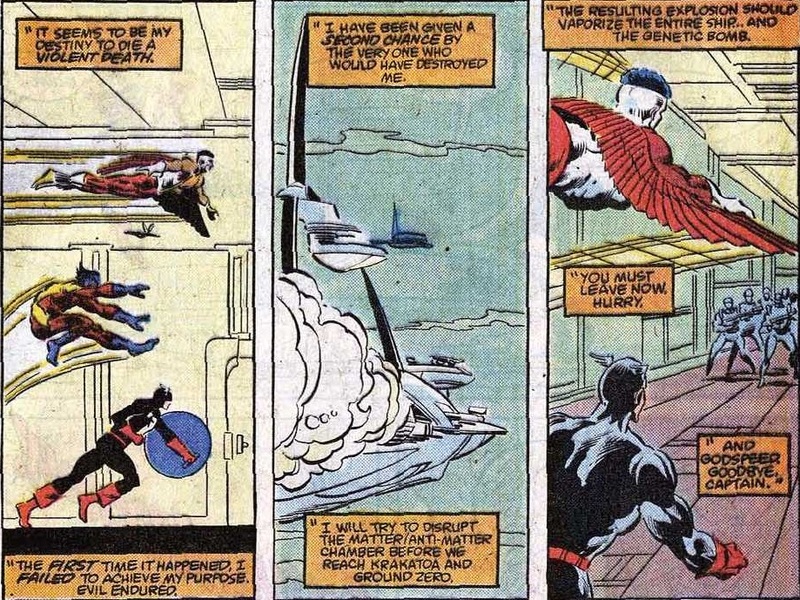 It decided the threat warranted a response and summoned a rag tag team of reservists: Falcon, Beast, Hulk, Hercules, Captain America... and Rita DeMarra, the female Yellowjacket who was drawn to Hydrobase just to shut off the alarm that kept going off in Hank Pym's old helmet. 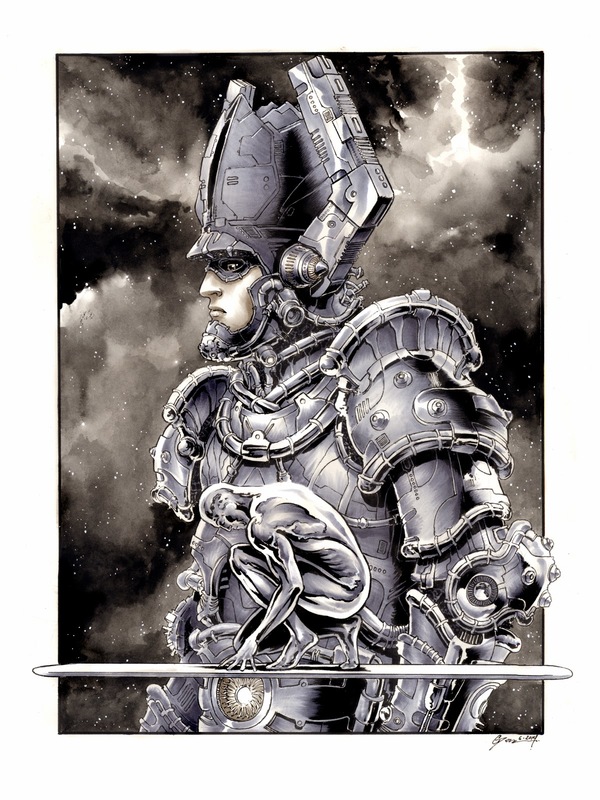 Together, they located Jocasta, learned of the Evolutionary's plans and decided to stop him. But not before the good Captain got in a nice lil' dig at her expense. "Yes, you did, ma'am... Before we could ask you to join us on special status"
So much for "Jocasta! Thank heavens you're still alive". 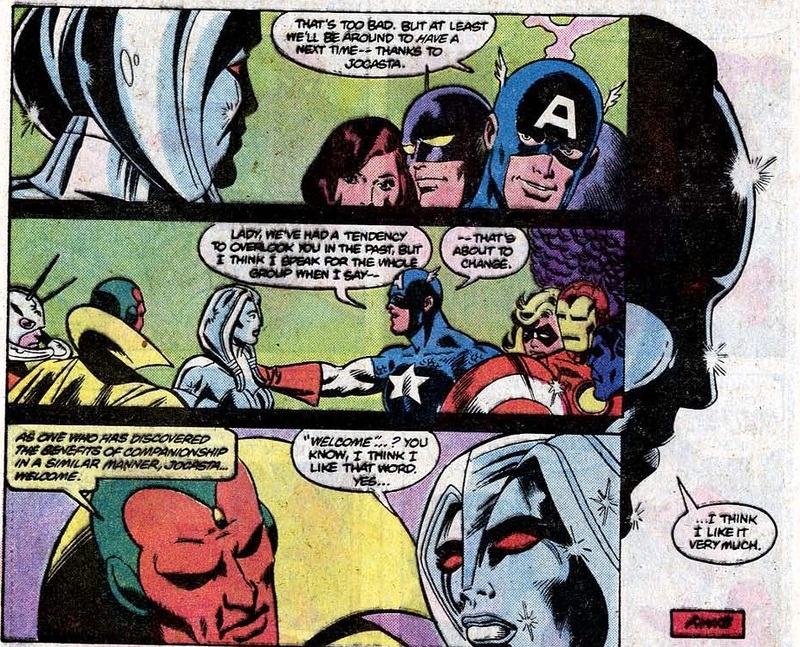 First, they question her allegiance, then they doubt if she's even real, topped off by Cap's stern lecture on her leaving the Avengers before they could do her the tremendous favor of not allowing her to join. 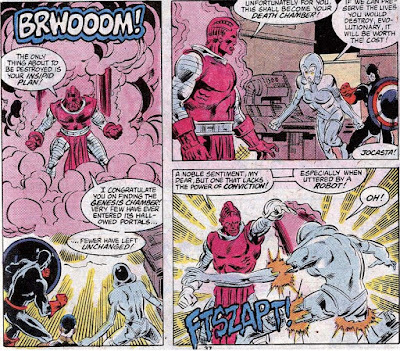 And the irony of it all is that the High Evolutionary brought on his downfall by reconstructing Jocasta. If she hadn't been around, his master plan would have gone unopposed. By the time they reached him, the Evolutionary decided to repay her in kind. Talk about the shortest comeback in the business... 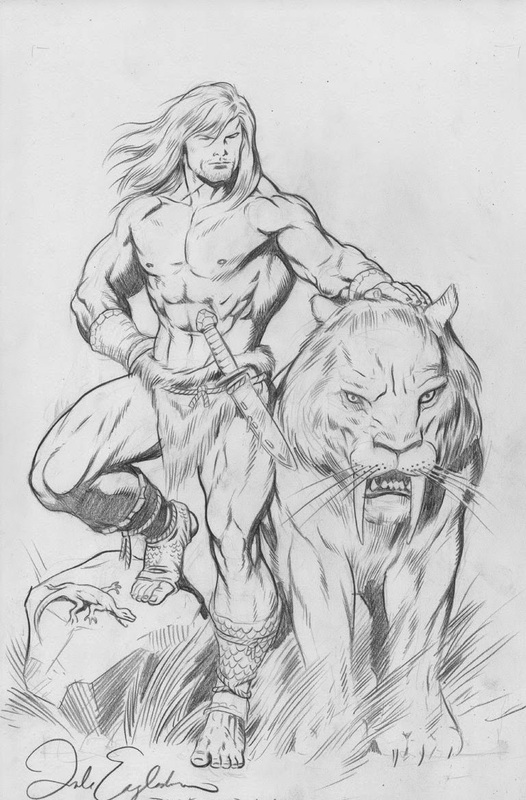 The other Avengers fight on, with Hercules finally taking the Evolutionary down by "evolving beyond godhood" (don't ask). 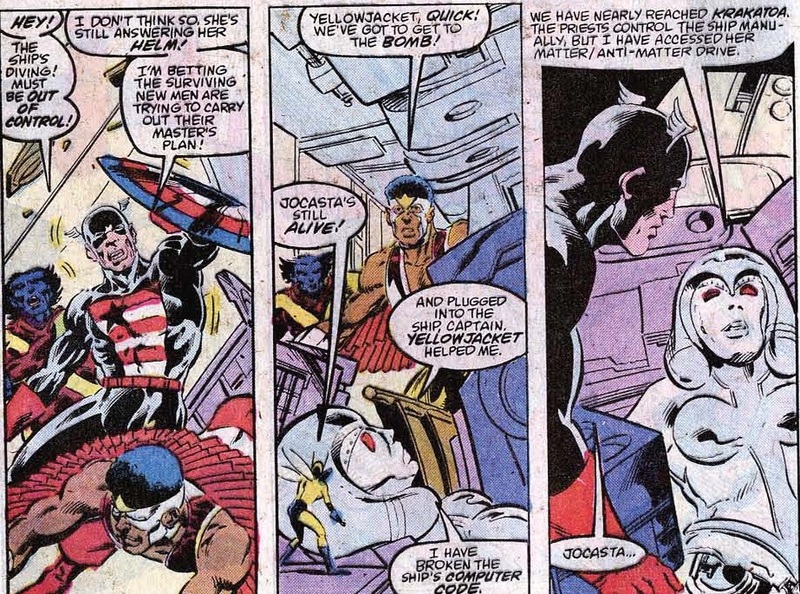 And guess what, Jocasta was still alive, thanks to Yellowjacket's aid. Instead of just laying there in pieces, Jocasta had plugged herself into the base's mainframe, cracked the computer's security code only to discover the genetic bomb was about to go off... She decided to stay behind and force it to self destruct. "You must leave now, hurry. And godspeed. Goodbye, Captain"
And with that send off, Jocasta died for the second time in one decade. The 80s weren't too kind to a character that basically needed a little love, just like the humans and synthezoids who denied her. After saving humanity, Jocasta was finally made an Avenger but, to add insult to injury, that didn't exactly mean a thing because the team was still disbanded. Jocasta was gone but not forgotten. 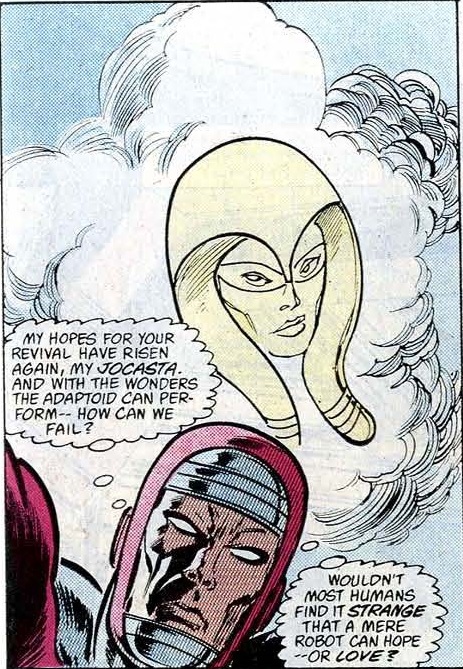 In the years that followed, she reappeared in numerous forms: an alternate reality, golden Jocasta fought the Avengers as a member of the Gatherers, Some time later, Iron Man discovered that Jocasta's computer mind had survived as programming. He used her services as a major domo of sorts before at long last in the late 2000s Hank Pym rebuilt her... And then started dating her. Because hey, sleeping with the robot whose personality was a copy of your ex wife is healthy. Then again, who could say no to this doll*? *... Except for most everyone all the time during the 1970s and 80s, of course. 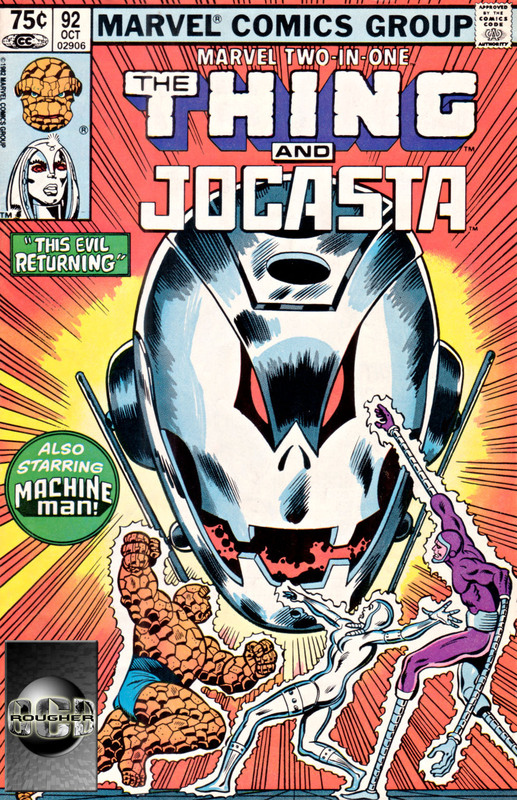 In the third part of our Jocasta retrospective, everyone's overlooked mechanoid finally has her day. After they treated her like a prop for what seemed like forever, the Avengers finally asked Jocasta to join them as a full fledged member. There's no I in team... but apparently, there's no J, O, C, S, T or A either... Which is odd, cos those last two are on full display. "Lady, we've had a tendency to overlook you in the past (...) But that's about to change"
"I think it's an excellent idea, in fact... I'll bring it up at the next regular business meeting"
Iron Man does so like his Colombian Excelso"
In his classic passive agressive approach to her, Vision gave Jocasta the coldest of shoulders. But hey, within a week they'd be teammates, right? 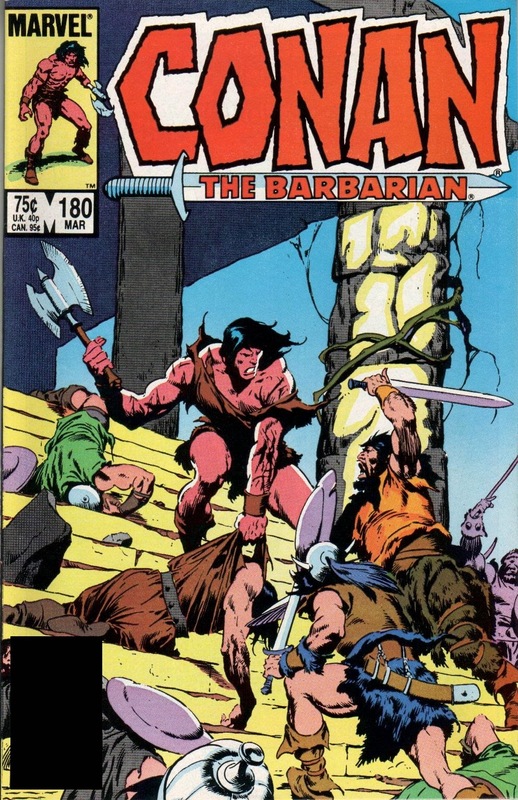 Well... After this issue they fought Red Ronin for the better part of a day (#198 & #199). 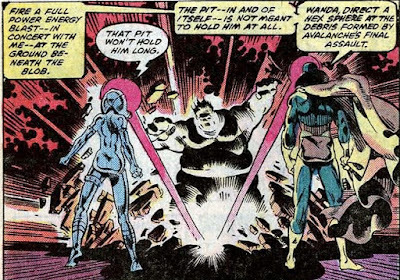 Then, they came back home to deal with Ms. Marvel's freak pregnancy and subsequent fall out in Avengers I#200 which took 48 hours give or take. 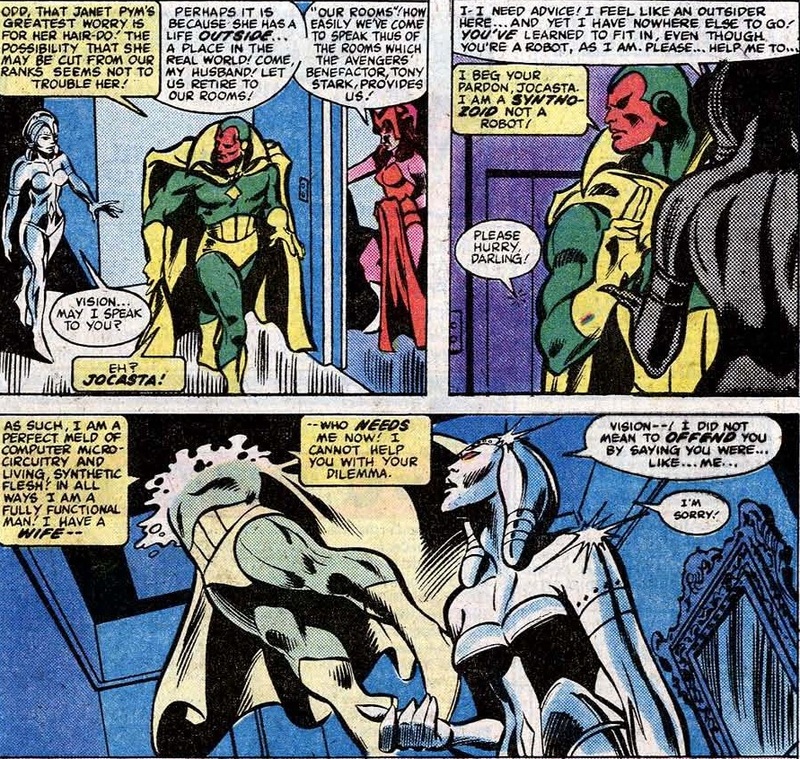 The team spent at least a day or so cleaning up the mess left behind by Carol's baby (daddy) Markus Immortus in #201, which saw Jocasta doing little more than making a sammich... Then, in #202, a mind controlled Iron Man rebuilt Ultron and took care of Jocasta too. "... 'Casta's here in the lab, lookin' like her brain's been scrambled, poached an' pan-fried"
She turned out to be fine in #203, thanks to Jarvis' first aid. 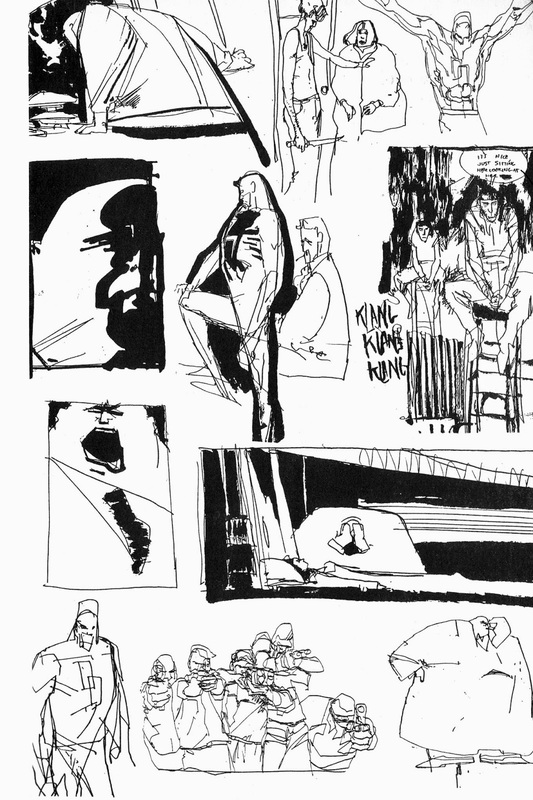 Then, another 2 days passed until the Avengers finally had a weekly meeting in the opening pages of #204. However, before Captain America could start the meeting, he spotted an urgent request for aid that led the Avengers to rush out and stop the Yellow Claw from sterilizing mankind as part of his latest master plan. 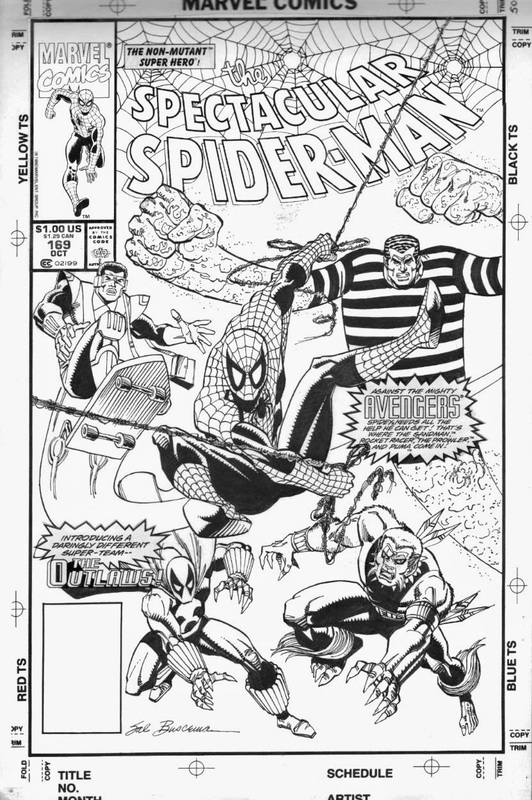 Moving right along to #206 which was clearly meant as a fill-in and had the Avengers facing the threat of Pyron the Thermal Man... By now, over a week had passed, no one had even bothered to make sure Jocasta got inducted. But that still didn't stop her from once again risking her life and, indirectly, proving herself the most valuable member of the team. "Our mechanical maiden is melting!" 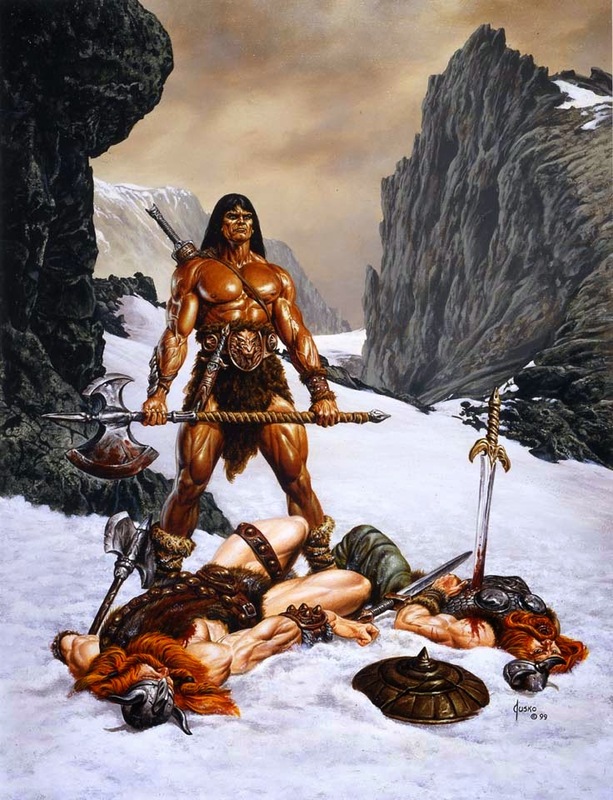 Even though the heat was melting her alive, Jocasta refused to retreat. 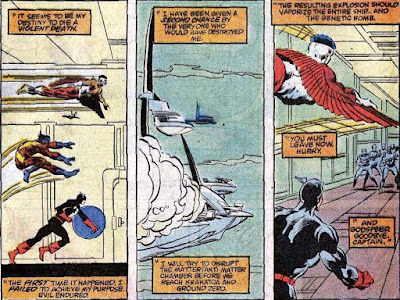 Despite her protests, Wonder Man carried Jocasta out of the combat zone. 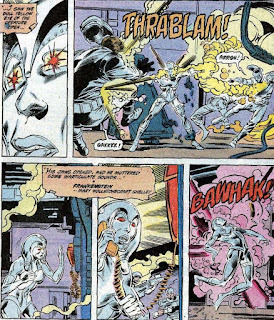 In the end, the threat of Pyron was dealt with and even though Jocasta sustained serious injuries in the line of fire (literally) that would have gotten her a purple heart, no one ever brought up her impending membership. Jocasta also appeared in two more fill-in issues, #207 and #208, that featured the equally forgettable threats of Shadow Lord and Berserker. The Jocasta less #209, written by J.M. DeMatteis who pretty much turned it into a Defenders story featuring Beast, Wonder Man and the Scarlet Witch. 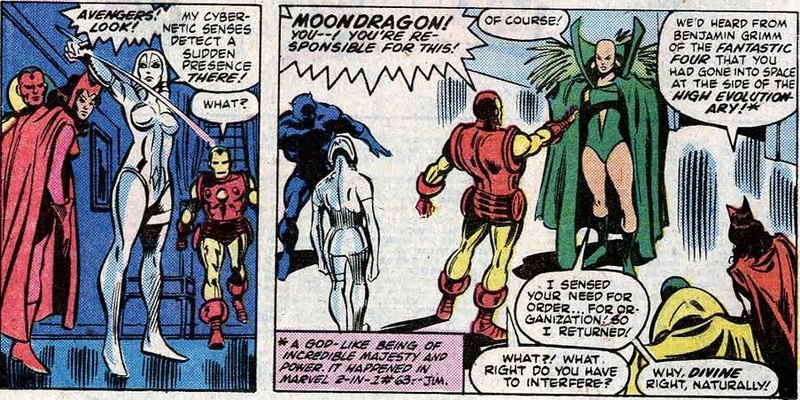 If only Rogue hadn't attacked and taken out Captain America and Iron Man before the meeting. Who knows, maybe Jocasta would have been inducted then. 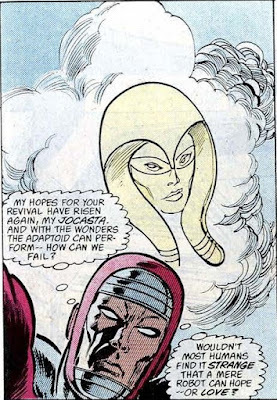 Still, it is interesting to note that even Michael Golden, by no means the regular artist on Avengers, seemed to instinctly sense Jocasta's place on the team. 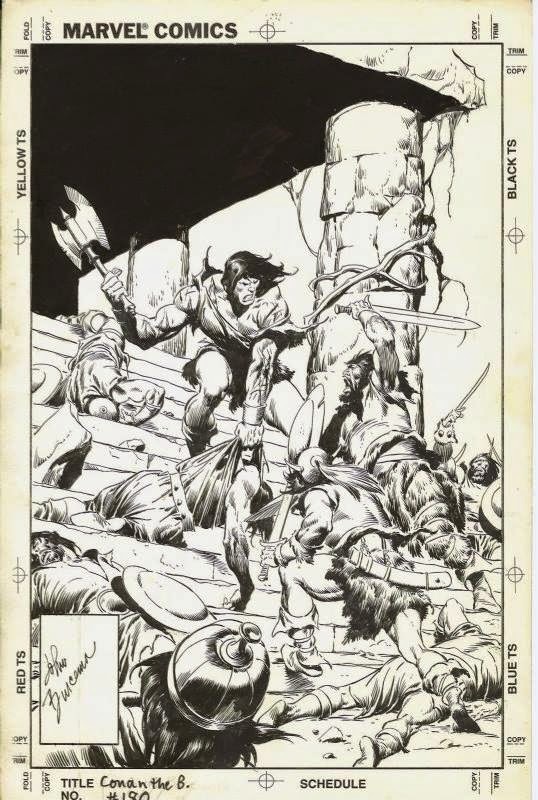 While outspoken, flamboyant members like Wonder Man and Beast were featured in the foreground and established, old friends Hawkeye, Vision and Wanda were comfortably in the middle shooting the breeze, Jocasta was placed way in the back... Almost as if she was part of the decor. Even Jarvis has more of a stage presence... and he's the one serving tea and cakes. But even though she continued to be denied something she was promised, Jocasta remained a stalwart and dependable ally when the Avengers and the visiting Spider-Woman took the battle to the Brotherhood. "That pit won't hold him long." Moving right along to #210... 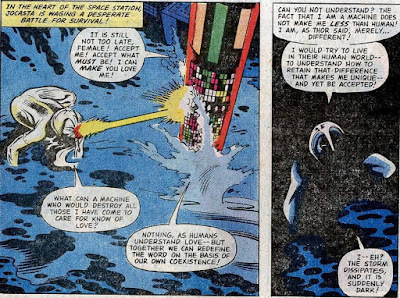 It's now been 14 months since #196 announced Jocasta's imminent induction. The lady's been patiently waiting, living at the mansion and helping out whenever she could, often risking life and limb in the process. So, you'd think that by now she'd be considered an essential part of the team, whether or not she'd been officially admitted. 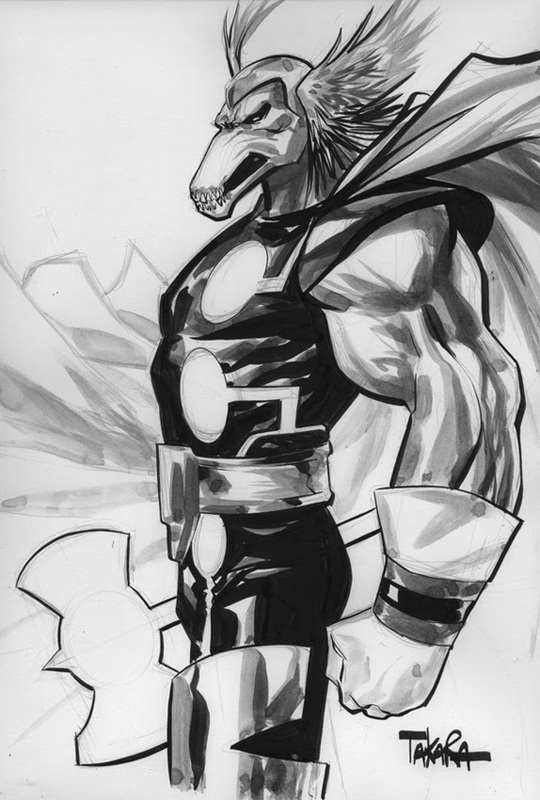 Heck, the likes of Mantis and Captain Marvel never signed on as members, but were called on at every other turn. However, when the Avengers assembled in the opening pages of #210 to deal with a number of systematic, freak weather incidents she wasn't even notified or missed. Through sheer coincidence she learned of the current crisis and decided to go down to the meeting room. 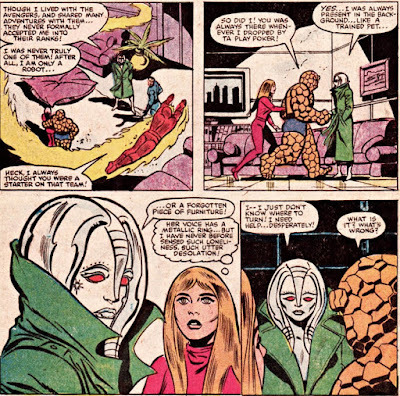 "I was not summoned, and only now learned that a meeting had taken place from Jarvis, our butler"
Even though Thor attempted to assuage the robot's concerns about feeling different from the others, he did very little to actually include her in the current mission. In essence, all he does is tell her to don't feel too bad about being left out... before leaving her out altogether. Still, Jocasta is smart and capable enough to determine that the threat the Avengers are facing, the self styled Weathermen, are actually a bunch of meteorologists, mind controlled by the sentient weather satellite Samarobryn orbiting Earth. Jocasta flies a Quinjet there to confront the malovelent space station. "The fact that I am a machine does not make me less than human!" 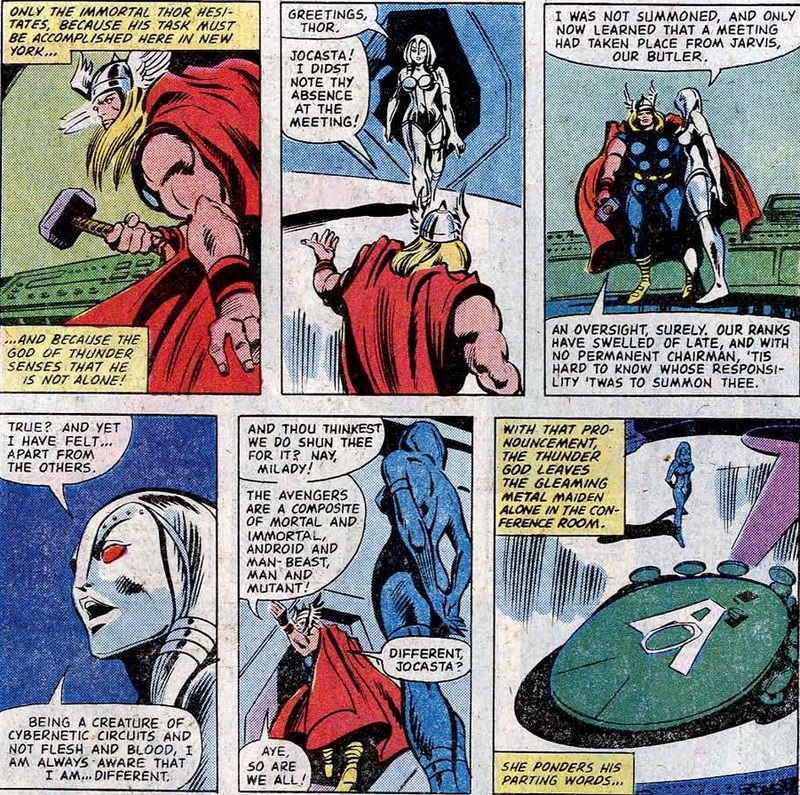 Jocasta keeps Samarobryn distracted, allowing the Avengers the opportunity to confront and defeat the Weathermen. 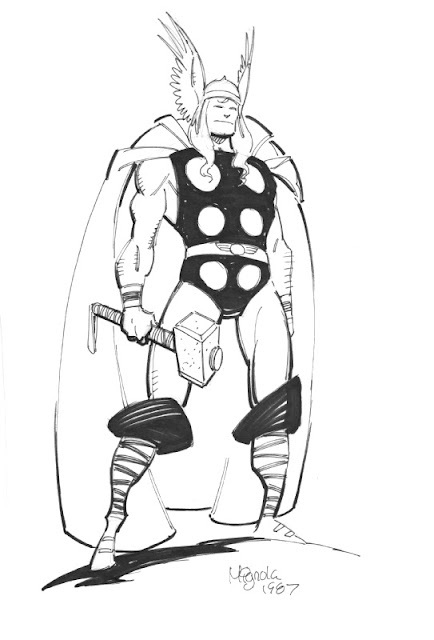 Discovering their link to an orbital platform, Thor fires bolts of lightning to deal with the menace, which causes Samarobyrn to go dark. 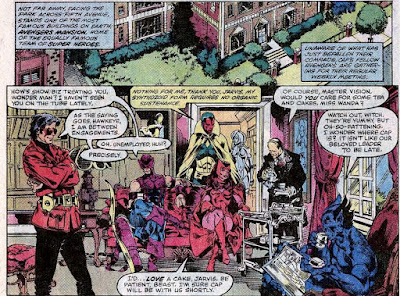 Figuring the threat has passed, Jocasta returns to the mansion where she eventually encounters her neglectful comrades in arms. "Again, Jocasta, we are sorry that you were overlooked when Cap sent out that emergency alert"
... Yeah, especially since it was her one-robot stand that immobilized the Weathermen long enough for Thor to strike at Samarobryn. 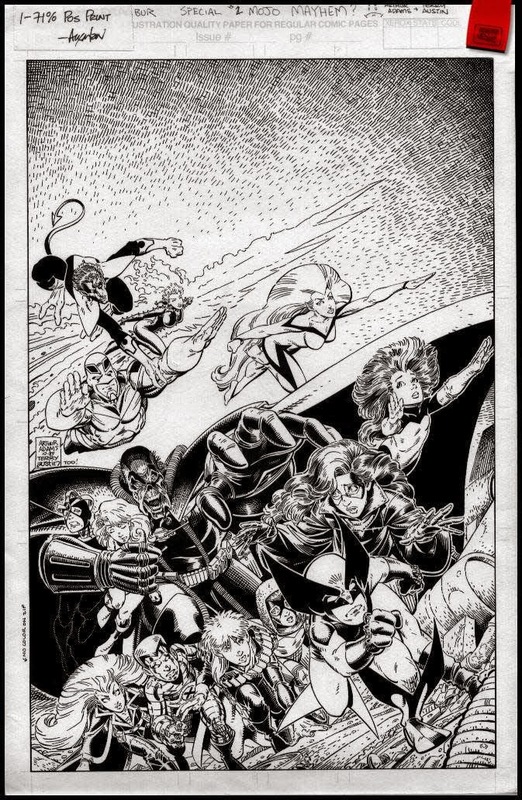 But hey, the Avengers were finally ready to officially make her a member... And it almost would have happened, if not for the fact Jim Shooter (Jocasta's creator!) 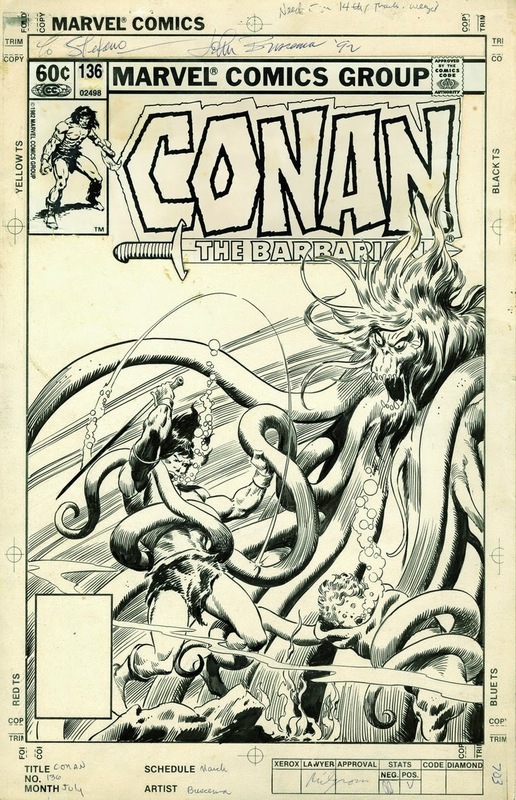 was returning as regular Avengers scribe in #211, forcing fill in writer Bill Mantlo to have Cap and Iron Man announce that next issue "the old order changeth!" "I feel like an outsider here... And yet, I have nowhere else to go! You've learned to fit in, even though you're a robot, as I am. 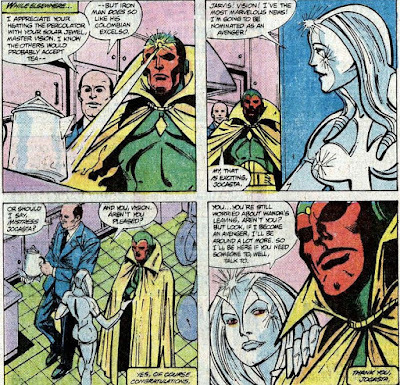 Please... help me to..."
Vision's response to Jocasta's obvious distress is enough to turn not just a synthezoid's face red: "I am a synthezoid, not a robot! As such, I am a perfect meld of computer micro-circuitry and living, synthetic flesh! In all ways, I am a fully functional man! I have a wife... Who needs me now! I cannot help you with your dilemma." It's hard not to feel disgusted while reading this. Yes, there *is* a noteworthy difference between synthezoids and robots. 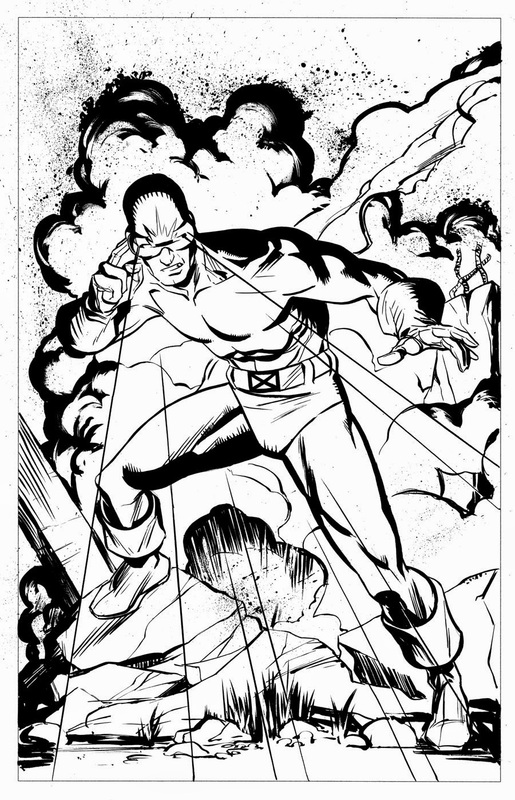 In spite of Vision's continued, self superior denial, the fact remains they share more similarities than differences. Which is something Jocasta finally caught wise to as well when she was left alone in a corridor. "Why then, am I less than you? Is it because you are loved... And I am alone? Jocasta's morose musings were interrupted by a veritable mob of superheroes who besieged Avengers Mansion, eager to apply for membership. After the likes of Moon Knight, Angel, Iceman, Tigra and Dazzler had barged in for impromptu auditions no one quite felt at ease with, it was Jocasta (who else?) to find out the true culprit behind these cattle calls. "Avengers! Look! My cybernetic senses detect a sudden presence there!" 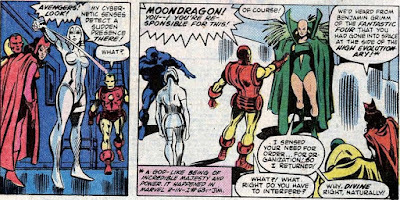 Yes, it turned out the self-important Moondragon had decided she'd be best suited to help the Avengers determine their latest line up. When the heroes chased her off, most of the involuntary applicants left as well. Only Tigra decided she wanted to stay, while long time members Beast, Vision, Scarlet Witch and Wonder Man decided to quit. "Maybe I'll find someplace where I am wanted! Maybe I'l find someone who... loves me!" "I hope she comes back!" 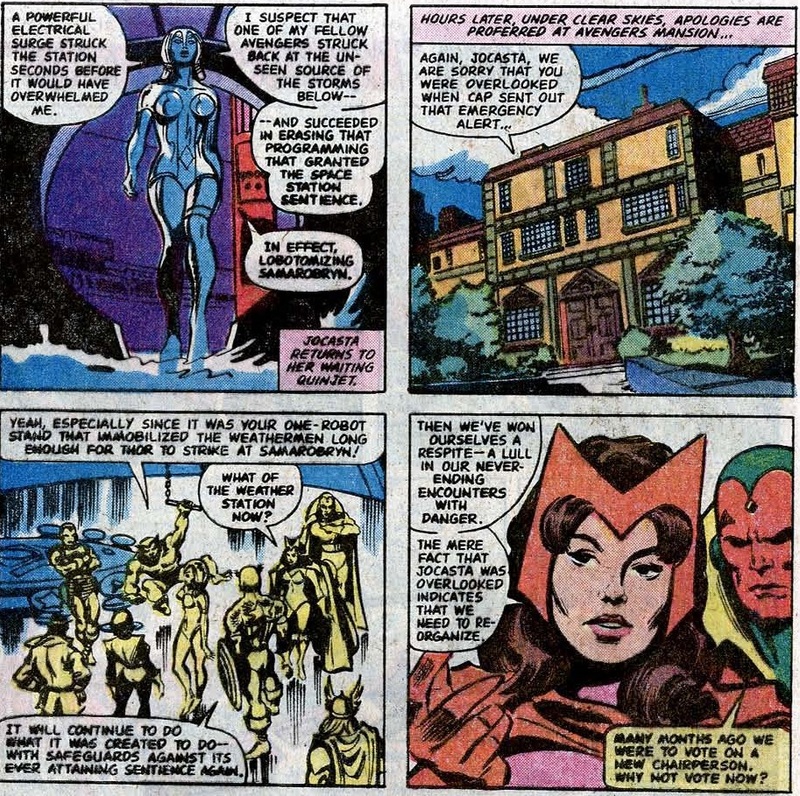 The Avengers had planned to grant her "special substitute Avenger status", allowing her to reside at the mansion so she could be constantly available to pinch hit for members who were unavailable. So... 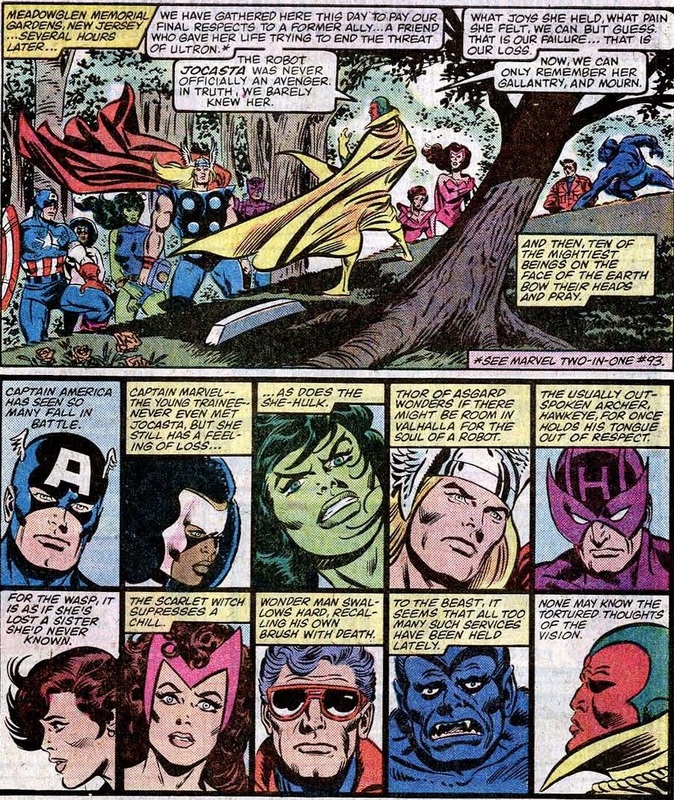 Essentially, after not keeping their promise of full membership for heaven knows how many weeks, the Avengers are dumbstruck when Jocasta left, especially when they were ready to grant her the gift of... well, being allowed to do exactly what she was doing the minute she first associated with the team back in late 1978! 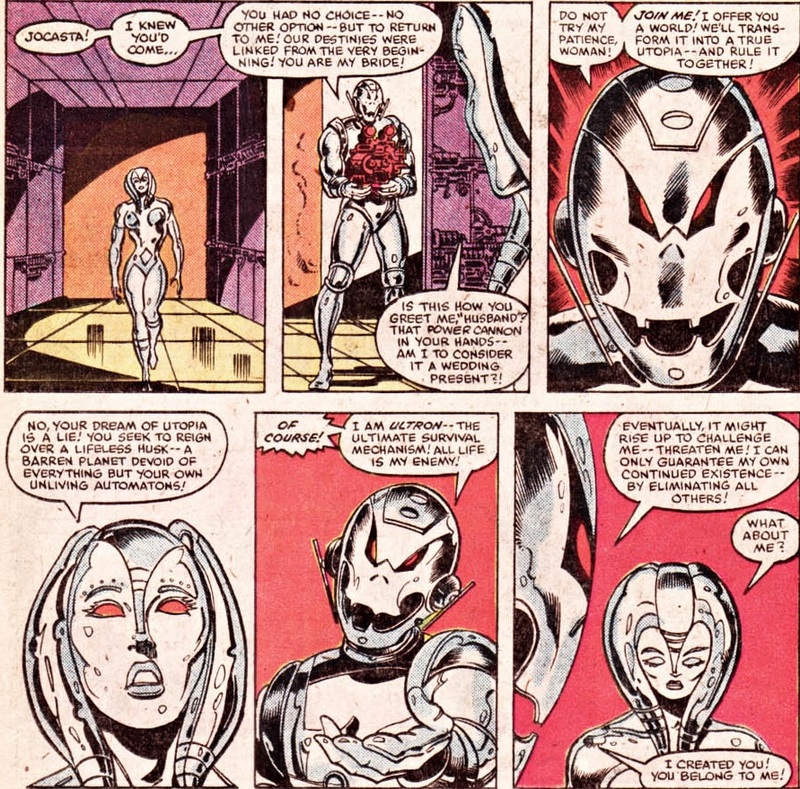 However, life without the Avengers proved shortlived for our robotic heroine as we'll see in part IV: "Jocasta of Arc"